James Dyson is not only an inventor in his own right, his annual design award spotlights other emerging inventors worldwide. In my recent post, “James Dyson Awards 2016 Targets Design, Not Brand,” it was noted this competition is hosted by Dyson’s charitable arm, the James Dyson Foundation, which provides university design and engineering students with a platform to launch their ideas. This year’s award deadline for entry submissions from 22 countries closed on July 19 — and on September 8th, the American winner was announced. 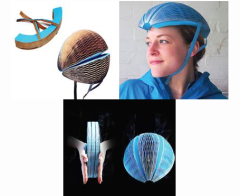 The EcoHelmet designed by Pratt Institute Industrial Design student Isis Shiffer was selected as the U.S. 2016 National Winner. This innovative was inspired by the growing number of bikeshare operations, which recently launched throughout the country, such as Citi Bike in New York City. 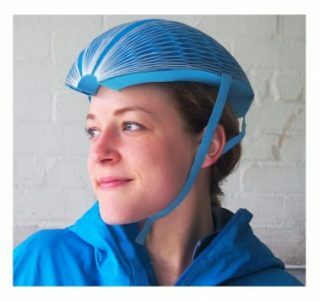 This innovative helmet is a foldable, recyclable, bendable helmet for bike sharing, allowing cyclists to ride confidently and safely. It addresses the need for safety, while being environmentally friendly and inexpensive. Working with bike-sharing companies, riders simply purchase the helmet when they rent bikes, and then recycle them after use. “It's incredibly validating to be recognized by an organization I respect, especially as I associate Dyson with the sort of practical, problem solving design that I aspire to make myself,” adds Shiffer. EcoHelmet will receive $3,500 from the James Dyson Foundation, and progress to the international stage of the award program, where a panel of Dyson design engineer judges will review all of the finalists and pick the International Winner and two International Runners-up. This year’s judges include Joe Brown, Editor of WIRED, Hannah Chung, co-founder, Jerry the Bear and Kent Frankovich, founder of Revolights and a past winner. For more information and regular updates on the progress of the James Dyson Award, you can follow the James Dyson Foundation on Facebook and Twitter. For more information regarding next year’s awards, you can contact the press office at uspr@dyson.com or 312-237-3972. Want To Cook Something New? How About Using A Condom?